Broadway looking East, circa 1954. Pictured: Tomlinson's & Venters, P.D. Poston Grocery (later Turner's IGA). Not yet built are the Johnsonville Pharmacy or the old Johnsonville Post Office (which opened in 1958). 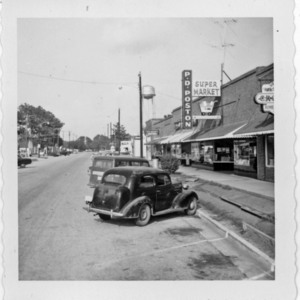 “Broadway looking East, circa 1954,” Johnsonville SC History, accessed April 19, 2019, https://www.johnsonvilleschistory.org/items/show/312.